Homepage for this website (which, as explained there, is unofficial). The decision of the Cambridgeshire Executive within Scouting to sell the campsite resulted in a good deal of controversy in 2013. Some links on the subject are collected below. Some of the information is out-of-date, as it was written before the bid to buy the site from Cambridge International School, who have now purchased the site and plan to continue to make it available as a campsite. I haven't updated the text or external links since then; some links may be broken. From 1932 until 2013, the campsite was under Scouting ownership for use as a County Campsite for Cambridgeshire. It was known as "Little Abington Campsite and Training Ground". There's a little more about the early history on another page. Although the campsite was intended to be used as a County Campsite, it was owned by trustees on behalf of Cambridge and District Local Association. This was just one of the Local Associations of Scouting within Cambridgeshire. The Local Associations subsequently became Scout Districts. At some point the day-to-day management of the campsite was taken over by Cambridgeshire Scout County from Cambridge Scout District (or the body that became Cambridge Scout District). Cambridgeshire Scout Council Executive Committee decided at their meeting on 20th February 2013 to sell the campsite in its entirety with the already-acquired planning permission for residential development, for as much money as it would fetch. You can read the advertisement (with further details) from the agent January's. The statements that were on the Scout County's website about the sale (archived here) have recently been removed. The current statement and update are on this page. The Scout County was, it turns out, considering selling the whole site back in October 2012, though this was not widely known at the time. The contact details for the Executive Committee are to be found here. A group called FACS ("Friends of Abington Camp Site") has formed to look at whether the site could continue to be kept open for use. They have put out a press release. (Click here to read it.) Their e-mail address is facs1932@btinternet.com; they'd be interested to hear from anyone interested in helping to save the campsite. A group of concerned parents was set up at a meeting on Monday 13th May 2013. The contact for this group is Paul Morris. There is a "Save Our Abington" Facebook page, which includes lots of good pictures of the campsite. Linked to this is a twitter feed. A Cambridge academic has set up a blog with details of why he thinks that the campsite shouldn't be closed. It includes an analysis of usage data, and much more besides. The first post on this blog, which claims that data supporting the campsite sale have been quoted in a way that is misleading, resulted in a Twitter post from science author Ben Goldacre. The MP for Cambridge, Julian Huppert, wants to see the site saved as a community asset, and has called for the national Scout Association to intervene. After meeting the County Commissioner, he has put out another statement. The MP for South Cambridgeshire, Andrew Lansley, has also expressed support for the campsite. 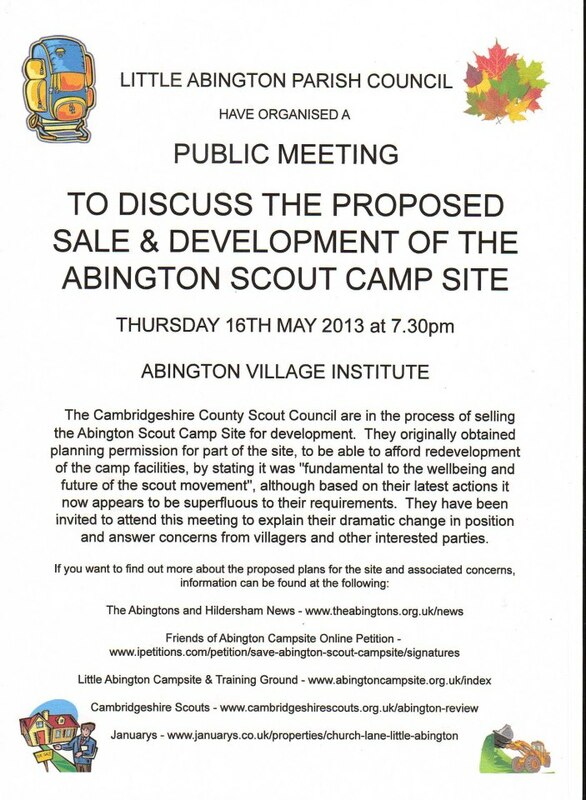 Little Abington Parish Council organized a public meeting to discuss the proposed sale and development of the site. This was on Thursday 16th May. There's a report on it in the Haverhill Echo. The campsite has recently been designated an asset of community value (table here), ensuring that there is a community right to bid for the site under the Localism Act 2011. There is now a page about it on The Place Station. Another blogger has a post here, and there's also a piece on Quora. Superseding the news in the last bullet point, there has been a successful community bid by Cambridge International School working in partnership with the Parish Council: there are more details at the top of the page. The campsite has been in the news recently, on account of the proposed sale. The FACS press release gives a list of links to newspaper articles. (More recent Cambridge News articles are here and here.) There is a story on the BBC website. The Facebook page also has copies of some articles from the local press, and links to others. The Escouts Community web-forum has had an initial thread, an enquiry to the Chief Commisioner, and a much more detailed follow-up thread about the proposed sale. There's another forum discussion on UK Villages Online. The campsite is used by many groups, inside and outside of Scouting, and in and out of Cambridgeshire. A few groups have their own web pages about Abington, with pictures of camps: see, for example, the 11th/9th Cambridge, and the 28th Cambridge. The proposed sale is mentioned in several editions of The Abingtons and Hildersham News.